Are you looking to play an online slot which is perfect for you and offers you best winning combinations so that you could big amount of money without investing much of your hard owned money and precious time? If the answer is yes then you are at right place. To make this possible you can play Cleos Wish slot machine which is developed and manufactured by Nextgen gaming software platform. The slot is of 5 reels and 25 paylines for which total coin are 30. 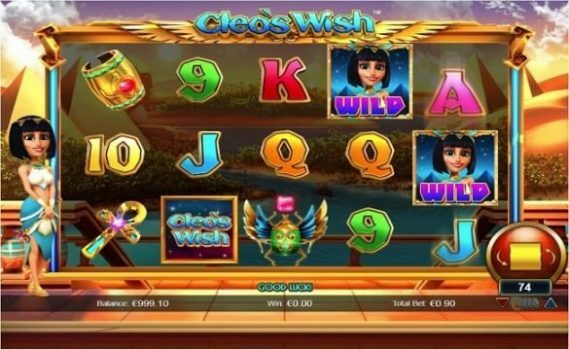 You can play Cleos Wish slot using your mobile or commuter for just starting coin sizes of 30pence per spins to up to £60 per spin. This is one of the brilliant slot machines from the house of Nextgen gaming to which you should take a look. There are a huge number of bonus rounds (total 6) available in this game. Lots of free spins, multipliers, wilds, scatters and many other top paying symbols are there in this slot game. The game also offers a jackpot of 500 times of your total stake and return of player percentage (RTP) is over 96%. Cleos Wish is an online video slot game based on Ancient Egyptian theme. The game contains cartoon style symbols. You will find symbols like scarab beetles, ankhs, bracelets, Cleo wish logo as well as A, K, Q, J, 10 and 9 playing cards on the reels of the game. The game also features a wild symbol in the form of Cleopatra. The wild can substitute all other symbols bar the scatter and it will pay you 1200 coins for 5 symbols across a payline. There are plenty of bonus feature available in this game during base game. You will get 3 randomly triggered bonus features during base game. The first bonus feature of base game is Sands of Fortune feature. In this feature all logo, scarab, bracelet and other symbols will transform to same randomly chosen symbols and they will form great winning combinations. The second feature of base game is the Add Wilds Reels feature and in this feature wilds can be randomly added to any position on any reel. The free spin feature of this game is Cleo’s Parade Free Games. This feature will be triggered when a stacked wild symbols appears on reel 5. The Eternal Riches Free Games feature will add 5 to 10 free spins in your account if you get 3 scatters.